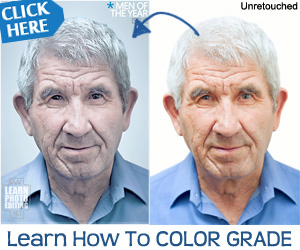 Professional color technicians typically set the highlights and shadows in an image by assigning their lightest and darkest CMYK ink values to the lightest and darkest areas of detail in the image. When identifying the lightest and darkest areas of an image, it's important to identify representative highlights and shadows. Otherwise the tonal range may be expanded unnecessarily to include extreme pixel values that don't give the image detail. A highlight area must be a printable highlight, not specular white. Specular white has no detail, and so no ink is printed on the paper. For example, a spot of glare is specular white, not a printable highlight. 1 Select the eyedropper tool, and choose 3 by 3 Average from the Sample Size menu in the eyedropper tool options. This ensures a representative sample of an area rather than the value of a single screen pixel. When you open Levels or Curves, the eyedropper tool ^ is still active outside the dialog box. You still have access to the scroll controls and to the hand and zoom tools by using keyboard shortcuts. • Drag the pointer in the image, and look at the Curves dialog box to find the lightest and darkest points in the range of values. This method does not work if the Curves dialog box is set to the CMYK composite channel. • Double-click the Set White Point eyedropper tool ^ in the Levels or Curves dialog box to display the Color Picker. Enter the values you want to assign to the lightest area in the image, and click OK. Then click the highlight you identified in step 3. • Click Options in the Levels or Curves dialog box. Click the Highlights color swatch to display the Color Picker. Enter the values you want to assign to the lightest area in the image, and click OK.